Greens are always my favorite in my diet, even my hubby love to have geens every day. My mother used to make mixed geen leaf curry (Kalakura) form spinach(Palakura), sukka kura, methi(menthem kura), bacchal kura and tota kura. I love this curry, it tastes wonderful and good for health, we can rarelay find such type of combos that are made tasty and healthy! Oops I think I deviated from the topic,. 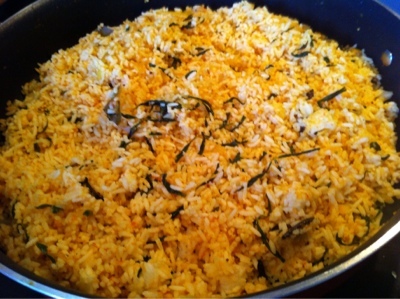 So, today I made this wonderful methi rice, I never know that methi rice tastes this good, because I always thought methi is sour in taste so the rice also will taste the same, but to my wonder the rice was that awesome that I and my hubby finsihed it in no time. Try it you will make it again and again like me!!! First prepare a curry paste with tomatos+Chili by grinding them together. Take a pan and add 2ts of oil/butter and heat it, to the oil add cinnamon, cloves, cardamom and bay leaves. when all the spices get baked add onions, curry leaf, ginger,garlic,little turmeric, and green peas and fry until the onions are finely cooked. Now, add the first grinded paste, methi leaves and coriander powder and cook until the raw flavor of tomato vanishes. 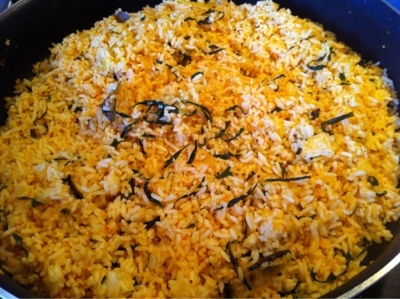 Add cooked rice and mix them. close the lid and cook in simmer for 2min. Finally garnish with cilantro and the delicious dish is ready. This one is my all time favourite among the pulaos.